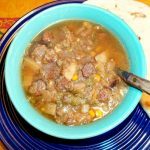 A heart and body warming All New Mexican Green Chile Stew for those cold days of fall and winter! Of course, nothing says you can't enjoy this yummy stew year round... OK, so this is a little more than 5 ingredients, I admit, but it's one of those that's well worth it, and still quick and easy. I never measure my ingredients, just throw in however much you want of all or some of the ingredients below! While oil is heating up in deep pot or skillet, put flour, salt, pepper in a large ziplock bag and mix well. Add the cut up meat pieces, shake and pinch to make sure all pieces get well coated in the flour mix. Add water to cover ingredients and then some. Cover and simmer anywhere from 4 hours to all day, adding some water now and then and giving it a good stirring . The flour from the beef pieces will give the stew some thickening. If using a slow cooker, cook on high 10 - 12 hours. Serve hot with warm tortillas or biscuits. Mimi's Tip: If I'm going to make a mess in my kitchen anyway, and have to chop and slice, I'd rather do a whole bunch, and then freeze in portion sizes. That way when Tom and I come in on a cold snowy winter day from digging out snow drifts to get hay to the cows and break ice on their water troughs, it's nice to be able to thaw out some already-made Green Chile stew, heat up some tortillas or biscuits and enjoy by the wood-stove!